Shira Lenchewski, MS, RD, thinks one of your most significant relationships might be in need of some therapy. And no, she’s not talking about the lucky person who gets to share a bed with you. 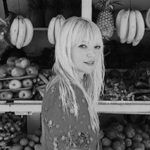 She’s talking about your fridge—and her new book The Food Therapist: Break Bad Habits, Eat With Intention, and Indulge Without Worry aims to make that connection a healthier one. While it would be unethical (not to mention uncomfortable) for a relationship therapist to let you peek inside her bedroom in order to lead by example, this dietary shrink has no such moral dilemma about sharing her habits. 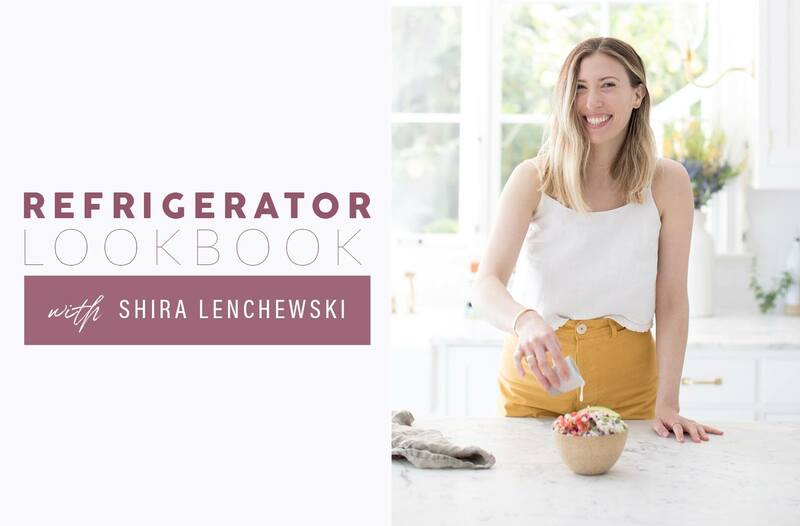 Here, she offers an up-close-and-personal look in her own fridge in order to better enable you to do not only what she says to do in the book, but also what she actually does IRL. 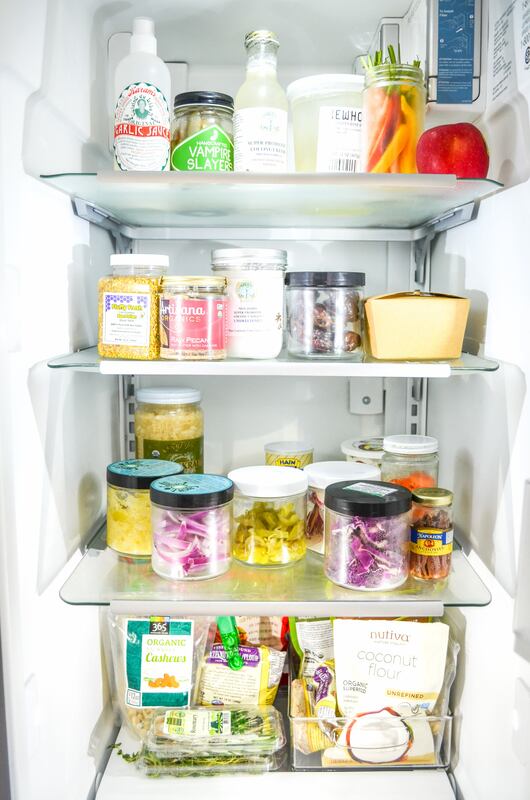 Keep reading to find out what The Food Therapist author keeps in her fridge. That garlic sauce jumps out at me right away. What do you use it for? It’s my secret sauce for everything from salad dressings to marinades. It’s super simple: fresh garlic, lemon juice, olive oil, salt, and pepper. It’s a garlic bonanza! Are garlic pickles one of your go-tos, too? Are you sensing a theme? I’m obsessed with garlic, and yes, these pickles are heaven! I’m pretty sure most pickles have garlic, but these are especially garlicky. In addition to the taste, I love them because they have no sugar added, which most pickles do. I hate to leave our favorite ingredient behind, but let’s switch gears. How do you use the coconut kefir? Coconut kefir is basically something I take a swig of daily for probiotics. There are always a lot of gut-health-boosting (microbiome-diversifying) foods in my fridge, for instance the kefir, kimchi, and there’s also sauerkraut on the second shelf. Your carrots look so much more enticing than does the bag of dried-out babies I keep shoved at the bottom of my fridge. I like to keep washed veggies like carrots front and center in my fridge when I can—dipped in garlic sauce, obviously—because when I’m in the mood for a snack, I’m less likely to want to wash and cut up veggies in the moment. I’ll gladly reach for them if they are already good to go, however. Where will all of the rest of those veggies, the pre-chopped ones on the second shelf from the bottom, end up? I find that washing and chopping is the bulk of the work [with cooking], so I like to have that stuff already done. That way, I can make assembly-style meals in a matter of minutes, whether it’s a stir fry, or a cauliflower rice bowl, or a salad. Do you have any other tricks for eating healthy in a hurry? Having multitasking sauces without sugar on hand is a complete game-changer. They can be store-bought or homemade. My favorites are dairy-free pesto, curry, and turmeric tahini, all of which are in my book. I can’t figure out what’s in the jar with the brown, wrapped things? Dates! I use dates in a lot of my recipes, and I like to keep them sealed for freshness. What else is hiding back there behind the flours? Those are Korean red pepper flakes that I use for making kimchi. I haven’t done it in a while, but homemade kimchi is of my all-time favorite things to eat. I’d eat kimchi straight out of the jar, I love it that much. But something really amazing happens when it’s paired with roasted nut butter. The nut butter tempers the fierce acidity of the pungent, vinegary kimchi in all the right ways and adds a little something you never knew you needed. Speaking of nut butter, find out which one is healthier: almond or peanut-butter. Or, give sunflower seed butter a try.